← Welcome To The Family Hiro! Well, the weather has gotten cooler and it seems my allergies are not as bad as the summer. My air-filter has switched to a humidifier, which has been incredibly helpful. I happened to love the fall. Nothing says happiness than to cuddle in warm blankets and get filling and yummy foods. Plus, Thanksgiving is almost here (MY FAVORITE HOLIDAY!!). As I mentioned before, with so many things going on, I don’t always have time for dinners that take a lot of work. 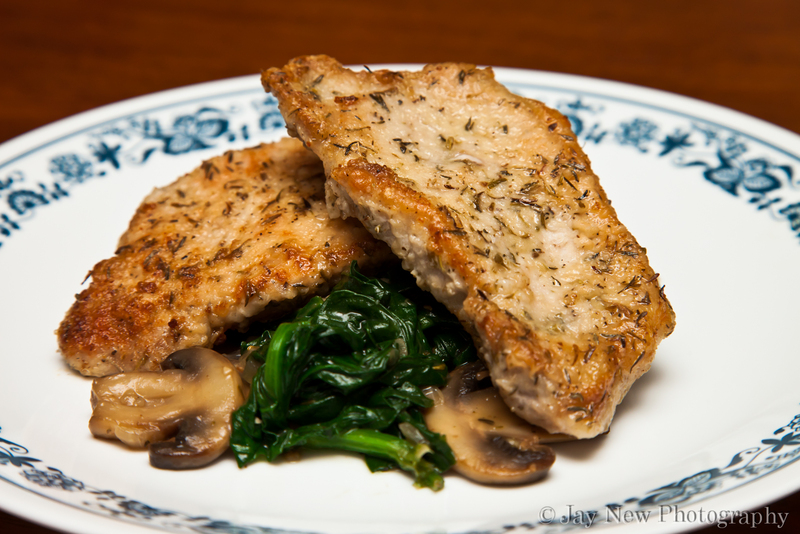 This recipe for Pork Chops with Spinach and Mushrooms was a quick dinner I made for my husband and myself. I was surprised how flavorful the pork chops were, even without marinating. This recipe does also translate over to chicken breasts/thighs. As always, enjoy and Happy Cooking! Combine flour, thyme and 1 teaspoon salt and a 1/4th teaspoon pepper. Lightly coat pork chops in flour mixture. In a large skillet, heat about 1 tablespoon of olive oil on medium-high heat. Cook pork chops (2-3 minutes per side, depending on how thick your pork chops are) and set aside under aluminum foil. In the same skillet, cook onions, mushrooms and garlic until they start to brown. Add oil if needed. Add reserved flour and cook until dissolved. Add spinach and allow it to wilt. Add any juices from pork chops. Serve pork chops over the spinach and mushroom sauce. Are you sure 6 TABLESPOONS of thyme? My it was good but I used 2 1/2 tbls of thyme and still to strong. Whoops! Good catch! Sorry about that. I would change that to a single tablespoon. I googled mushrooms, spinach and pork chops and this delicious meal popped up. Very easy to make and delicious. I did not have thyme, so substituted sage instead. Still good and as an added bonus, we have leftovers! pork chops and spinach? one of my favorite combos! yummy post! My girls and I love pork chops with just about anything (spice and sauce wise). These look good and I cannot wait to try the recipe. Thank you for sharing. Good to see you back. This looks wonderful. I know what you mean about leftovers too! Sounds so good! Can’t wait to try it! The last pork chop ideas you gave me were perfect! Thanks! Sounds yummy with just the amount of quickness I need right now. We need to seriously discuss your “freezer dinners” so I can prepare for the arrival of our bundle of joy.